This has been a week of video learning, reading, crafts, and language. I didn't even try to schedule lesson plans for this week, but took each day as it came. Amber is definitely in a flare of her symptoms and we had to visit her GI doctor this week to jump start the intestines. They are still uncooperative, but not as unresponsive. Wednesday Amber spent the entire day sleeping or eating. Literally. However, it worked and she was more functional on Thursday at co-op classes. Her body simply had hit its limit of activity during a dysautonomia flare. She had been quite active the past several weeks with too few rest days between the events. Last weekend we surprised our nephew (but his parents knew) with a visit on his 4th birthday! We even brought his beloved Grandma with us. 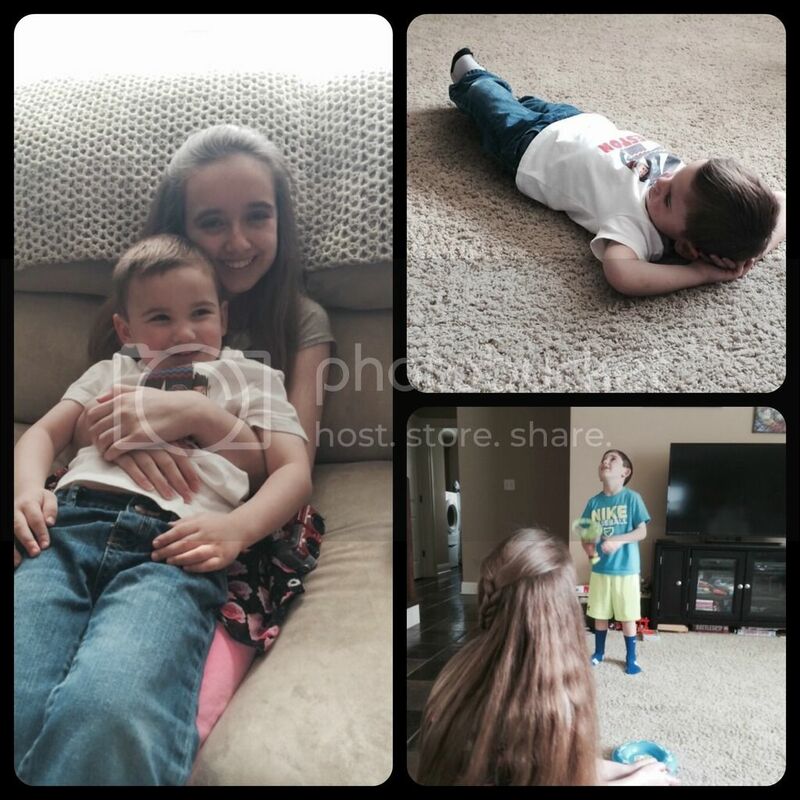 It was an afternoon of fun and just chilling on the floor. Morphemes continues to be a huge hit here. There is a Latin version of the same curriculum that we are considering for next year. It's also Amber's portable subject of choice. It easily travels wit us to doctors' appointments and in car rides. 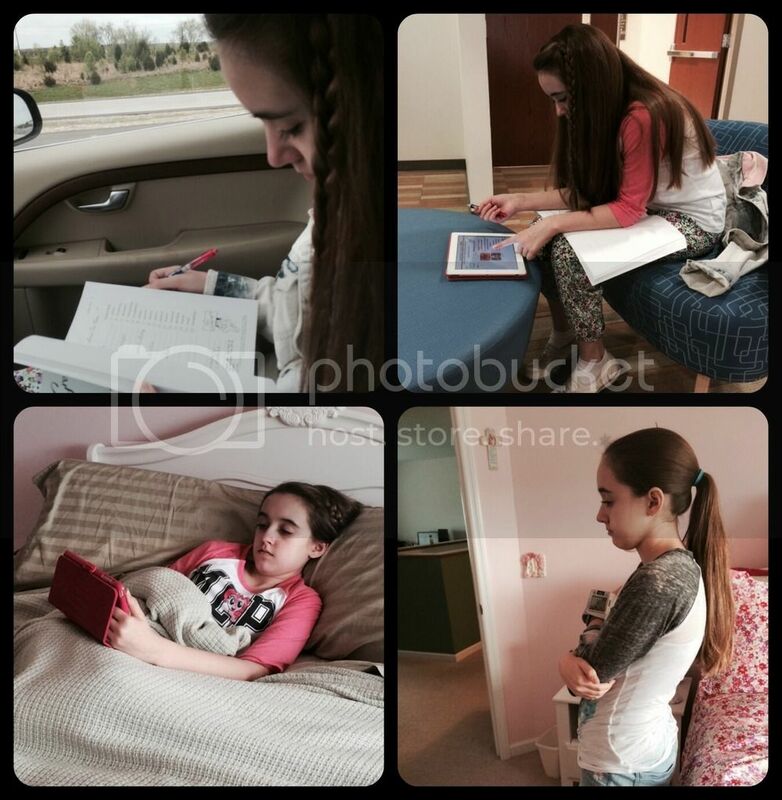 This week she worked on the morphemes at the allergist, in the GI waiting room, and even in the exam room. Amber caught up on Crash Course Astronomy by watching the most recent four videos, and found some Renaissance history episodes she missed earlier. Then we found Crash Course Physiology episodes on the Autonomic Nervous System (ANS) and the sympathetic nervous system. These topics were perfect for Amber as it's her ANS that's broken. The episodes even explained the ganglia and how they work. Since the doctors suspect Amber has autoimune autonomic ganglionopathy, this was good for her to watch. It explained it better than I ever have. Amber has been receiving Doodle Crate for several months now, but had fallen behind in using her kits. This week she made more ink stamps with her dad, and worked on the sculpting project from a couple months ago. She is is anxious to use the newest kit to make her own paper and book, but we ran out of time and energy. Amber also pulled out one of her unused latch hook kits and worked a whole evening on it. 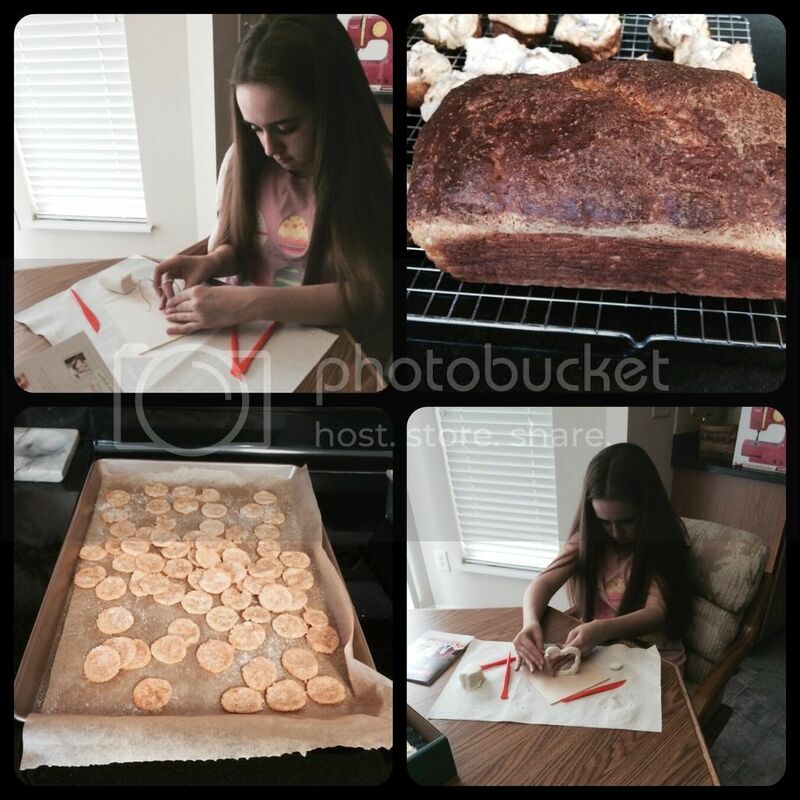 Doodle Crate sculpting, Sally Lunn bread, and Ritz crackers. In case you missed it, our review of Orphs of the Woodlands, Amber's very favorite online learning tool, is finally out! This is a fabulous product and Amber can't wait for the next book to be released so she can visit the Woodlands again. Check it out! This week I successfully tried a few new recipes for Amber. I've wanted to make gluten free Ritz crackers forever, but kept putting it off. In my opinion they taste appealing, yet somehow not really like a Ritz. Amber says they taste exactly like a Ritz, at least how she remembers them. At any rate they were a success. I also made a new yeasted bread - Sally Lunn batter bread. I'm not the best with yeasted breads, yet this worked out perfectly. Even the crust is right. Finally, a bread I can make. Amber and I have been having difficult discussions about math and are reconsidering our curriculum. This breaks my heart because she is so gifted in math; there has yet to be a concept she does not easily understand in algebra. She's not having trouble with her assignments nor her tests. However, on rough days math makes her feel so overwhelmed it triggers anxiety and causes a cascading effect of additional symptoms. Working 30 repetitive problems takes so much energy and is killing any interest she has in the math topics. To keep Amber's anxiety lower, we skip math on some of her more difficult days. In reviewing her logged school hours we noticed she has missed math fairly often recently. Realistically, for at least the near future, we need a better math plan than just hoping she feels up to math some day soon. Morphemes on the way to and at the GI doctor. Crash Course in bed resting. The dreaded orthostatic testing we do as part of regular neurology updates. Her numbers were weird this week. We love Saxon Math. Amber has insisted she can stick with Saxon and somewhat fears changing from the only math curriculum she's ever known. Still, we had a very frank discussion this week and after research have decided to give something else a brief trial. If it doesn't help her successfully complete more content with sufficient understanding of the concepts, then we simply go back to Saxon and shorten required problem sets. I was reluctant to even consider switching math programs in the past for fear Amber wouldn't have the mathematical base needed for a possible future in science, if she so desired. Amber has recently decided the reason she could never pick a science area of interest is because she's not a science person after all. It also explains why she isn't too upset when we skip a science experiment. While we will ensure Amber continues advanced math over the coming years, her decision has freed us from the crippling math worry and opened more possibilities to meet Amber's learning needs. This weekend I'm sewing like a mad women to finish Narnia costumes. Our last week of co-op is coming up, which means the play is next weekend. Amber is at the end of her energy and we are squeezing every last bit out trying to make it past the performance. Wish us luck next week. I think it is a wise decision to take a break on the current math and try something new. I get that completely. I hope next week is smoother for you all. Saxon Math gives me anxiety too! Amber's fav resources sound interesting. I think it's a great idea for her to learn as much as she can about her condition. And I am very impressed with your baking skills, Christy! I hope and pray you guys have a wonderful, stress free weekend and new week coming up! I just went and watched the Crash Course myself. I understood what the disease was doing but I never fully understood how those systems worked. It is much clearer now. We all learn something new, hopefully everyday. Math is our undoing every time. At least Amber is good at it. Keilee detests it. :/ Isn't Crash Course the best? Keilee has watched them for years (she LOVES Hank Green). Her Psychology this year (which is a college level class) almost always goes along with Crash Course Psychology. I hope you all are having a great weekend and sweet Amber is feeling better. I am about to check out 2 resources I have never heard of; Morphemes and Orphs of the Woodlands. We found Saxon to much, although it was a great maths program. I hope you find something which works well for Amber. Yay for home baking - it sounds like you have been very successful this week. Well done to both of you. Each week I am astounded by how well you manage life with some very tricky challenges. I hope you have had a wonderful weekend.